Following in the same lines as the reboot of the original Total Recall movie, Robocop is also having a remake of the 1987 film made and is expected to arrive in theatres in August 2013. The new remake of the original Robocop will by directed by Jose Padhila and star Gary Oldman, Samuel L.Jackson and Hugh Laurie to name just a few, and a new teaser trailer has this week been released. 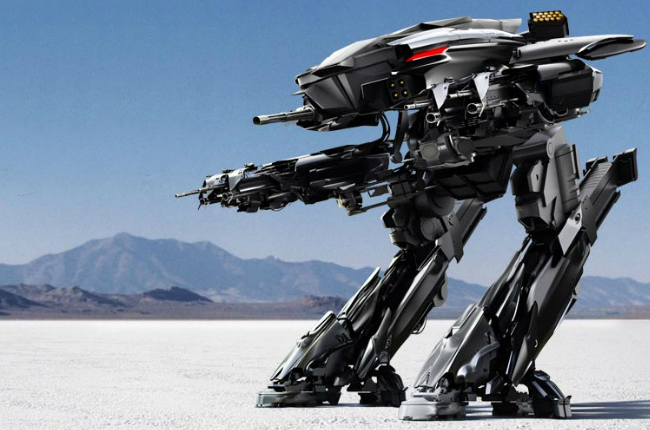 The movie concentrates on Omnicorp the company that builds Robocop, and also manufactured the predecessor to Robocop the ED-209 (pictured above) and specialise in weapons manufacture. The teaser trailer don’t give much away and it’s still early days to says whether the new movie will be an improvement on the original.